Vanatoo Transparent Zero speakers are one of the best small powered speakers on the market. We were quite impressed by the performance, sound quality, versatility, and overall price/quality ratio. If you are in the market looking for a pair of bookshelf/desktop speakers under $400, Vanatoo Transparent Zero must be on your shortlist. Read our in-depth review if you want to find out more. Transparent Zero comes from a small company called Vanatoo. 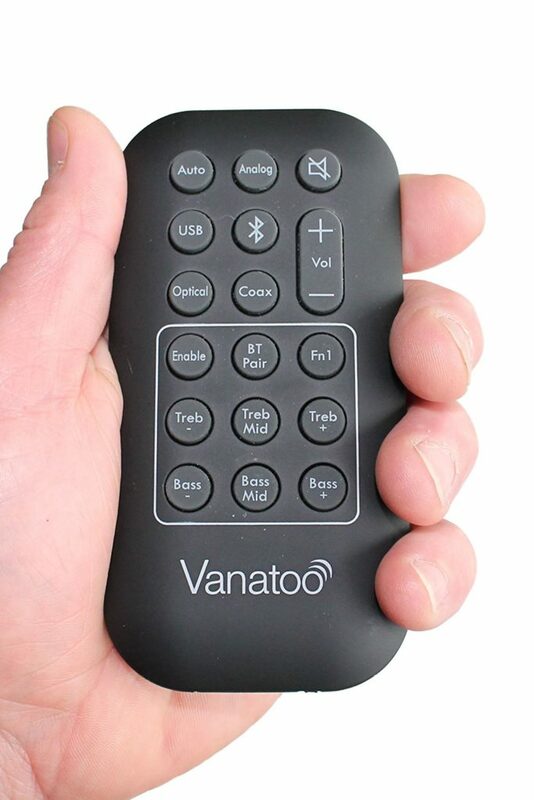 Vanatoo was founded by two audio enthusiasts, Rick Kerner and Garry Gesellchen. 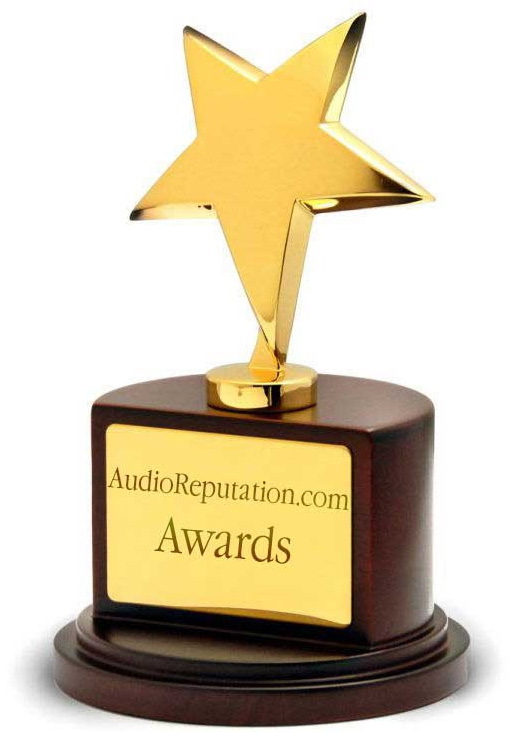 Their first speaker, Vanatoo One, was a huge success and it was highly praised by the audiophile community. The only problem with Transparent One was the price. This speaker set was priced at $600, which doesn’t make it the most expensive on the market, but it’s still pricey. The next step was very reasonable – after the initial success, the founders wanted a greater share and decided to make something smaller and a bit more affordable. The result of their effort is Transparent Zero. This is a pair of quite small but very capable powered speakers. Before we start, let’s make a short overview and list all the things we liked and didn’t like about Vanatoo Transparent Zero. Vanatoo Transparent Zero is an oddly shaped pair of speakers. Their unusual design enables high versatility in terms of placement options, orientation, and purpose. Transparent Zero speakers can be hooked up to your computer and used as desktop speakers or gaming speakers, they can be connected to your TV and used as TV speakers, you can use them as bookshelf speakers (only in small rooms). Thanks to the unusual design, they can be angled upward or you can choose the ‘’90-degree’’ orientation (with a down-firing or up-firing passive bass radiator). With all these different placement and orientation options, you will get different sound signatures and you can make different software adjustments to get the best performance for each orientation. This is a very customizable speaker set. The speakers are quite versatile in terms of connectivity. You can connect analog audio sources through 3.5mm AUX port. There are three digital connections – USB Type-B, digital optical (TOSLINK), and Bluetooth with aptX support. There’s also a subwoofer output so you can add an external subwoofer to this 2.0 system and get a much better low end. The thing that impressed us the most was the audio performance. That kind of balance, clarity, and detail is not something you expect from a pair of small speakers. To be completely honest, we were quite surprised. We have some small complaints regarding sound reproduction but all of them are actually solvable. When it comes to downsides, the only thing we didn’t like was the speaker customization. We like the fact that you can customize many things (speaker placement and orientation, DSP settings, sleep mode settings, stereo/mono output) but the procedure you have to go through to adjust these settings is quite complicated and requires using volume knob, V-T-B switch, and Pair-Prog button. You have everything explained in the manual but it’s still really strange and it’s hard to remember all those button combos. We also didn’t like the fact that the volume knob is located on the top panel and that it’s not easily reachable. Placing it on the front panel of the active speaker seems like a better idea. We don’t think that you can find a better-sounding speaker at this price point. They are small and don’t occupy too much space, they can be placed and oriented in different ways, they enable you to connect up to four audio sources (1 analog + 3 digital) and, most importantly, they sound amazing. The kind of depth, clarity, and detail you will get from Vanatoo Transparent Zero is hard to find at this price point and it is almost impossible to get from some other pair of speakers of this size. They absolutely deserve our recommendation. Inside a white box with Vanatoo logo, you will find your speakers (with removable handles/kickstands), power cable (with power adapter), a set of cables (3.5 to 3.5mm AUX cable, 3.5mm to RCA cable, USB Type-B to USB Type-A, and RJ-50 cable for connecting the speakers), 2.5mm Allen wrench (for removing/repositioning the handle/kickstand), 2 isolation pads, 2 removable magnetic grilles, remote, user manual, and 3-year warranty. TOSLINK cable is not included in the package and you should buy it separately. You can also buy the speaker stands (ISO-130 stands) if you want to. At this point, we would like to emphasize one thing – Vanatoo offers a 3-year warranty which shows that they really believe in their product and are prepared to stand behind it. The majority of manufacturers offer only 1 or 2-year warranty. Kudos to Vanatoo. Vanatoo Transparent Zero powered speakers feature odd geometry. The exact name of this kind of shape is truncated pyramid. The speakers are small but quite hefty. Their dimensions (WxHxD) are 4.75×7.5×7.75in. 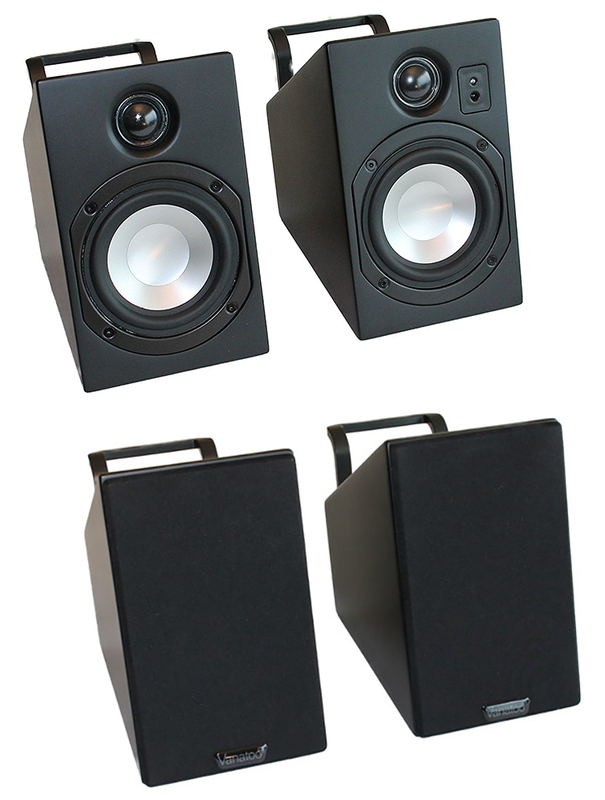 The active speaker weighs 4.5lb while the passive one weighs 4lb. There are a few interesting things about the speakers. First – there are no left and right speakers (only passive and active). You can place either speaker on either side and then simply change the software settings. By default, the active speaker is supposed to be your right channel, but you can place it on the left side and then adjust the settings. Second – the speakers can be oriented in different ways (upward angled baffle, 90-degree orientation with a down-firing or up-firing passive bass radiator). We will discuss all these features in more detail in the next two sections (Features and Performance). The drivers are located on the front panel. You have two custom-made drivers – 4in aluminum cone woofer and 1in soft dome tweeter. The active speaker also has an LED status indicator and IR receiver located right next to the tweeter. The speakers come with two very strong removable magnetic grilles. The grilles are black with a small Vanatoo logo on the bottom. In our opinion, these speakers look kind of raw and industrial without grilles. They look a bit more stylish with the grilles. 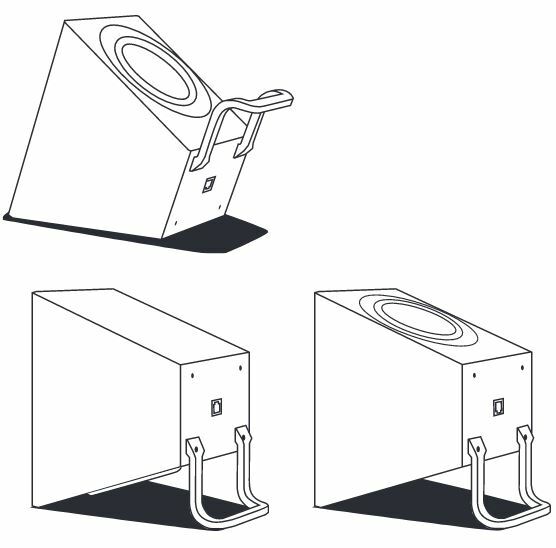 Each speaker features one passive bass radiator on the top panel (or bottom panel – it all depends on how the speaker and handle/kickstand are oriented). On the top/bottom panel of the active speaker, you will also find the volume knob, which is, actually, the multifunction knob. You can use it to adjust the volume, bass, treble, or to change some software settings. Both speakers have handles/kickstands preinstalled on the rear panel (the manufacturer calls them supports). Depending on your personal preferences and the orientation you want to achieve, you can remove them, or install them on the top or bottom end of the rear panel. All the inputs/outputs are located on the rear panels. The passive speaker features only one RJ-50 input (for connecting the active speaker). The active speaker features DC input, RJ-50 port, 3.5mm AUX input, USB Type-B port, TOSLINK input, SUB output (for connecting an external subwoofer). You will also see the pairing/prog button and V-T-B (volume-bass-treble) switch. Vanatoo Transparent Zero is one of the most versatile and feature-rich small speakers on the market. First of all, we will discuss the placement. 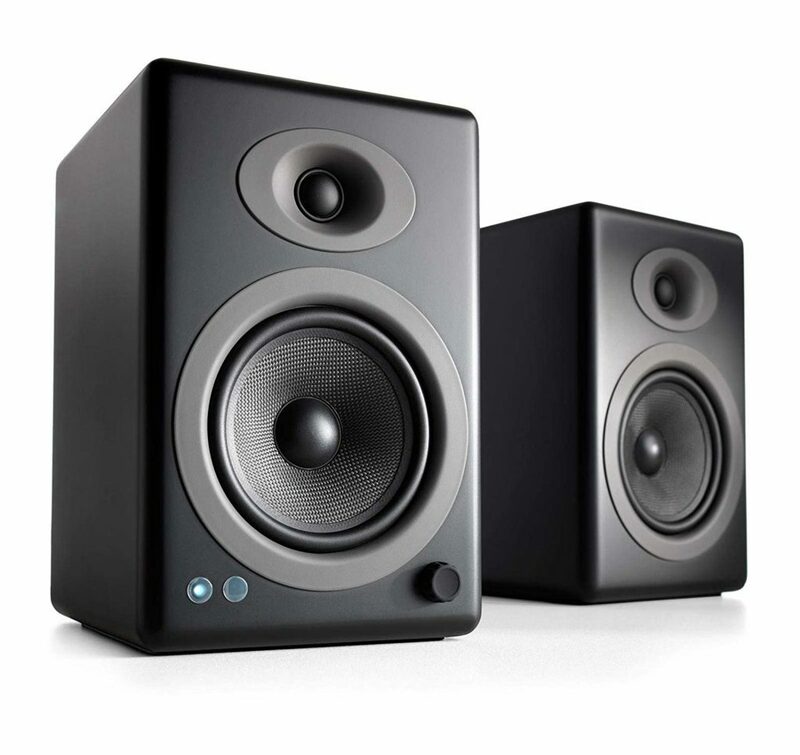 Most powered 2.0 speaker sets have predefined left and right speakers. You will find L mark on one speaker and R mark on the other and you can’t place them differently. Well, you can, but you will get the wrong imaging. There’s no such thing with Transparent Zero. Either speaker can be placed on the left or right side. The active speaker is, by default, set to be the right channel, but you can place it on the left side if you want to or have to (for example, if your wall outlet is located on the left side). After placing the active speaker on the left side, you just have to change some software settings (by selecting the right V-T-B/Pair-Prog/Volume knob combo) and you are good to go. We will explain how to do this in the next section. Also, thanks to those handles/kickstands you can orient the speakers in different ways. You can remove the handle or leave it and use them with upward angled baffles and up-firing bass reflex port. Or, you can flip them over and get 90-degree orientation (with a down-firing or up-firing bass reflex port depending on the kickstand position). When used in 90-degree orientation, the speakers are supposed to be at your ear level (placed on a stand). Depending on the placement and orientation, you are supposed to choose one of two available DSP settings (2 different tunings) – shelved and flat. Shelved is used when the speakers are placed close to a wall. Flat is used when the speaker is placed 2ft or further away from a wall. These two DSP settings have crossovers to the external subwoofers set at different frequencies (125Hz in shelved mode; 80Hz in flat mode). Each speaker has two drivers and one passive bass radiator. 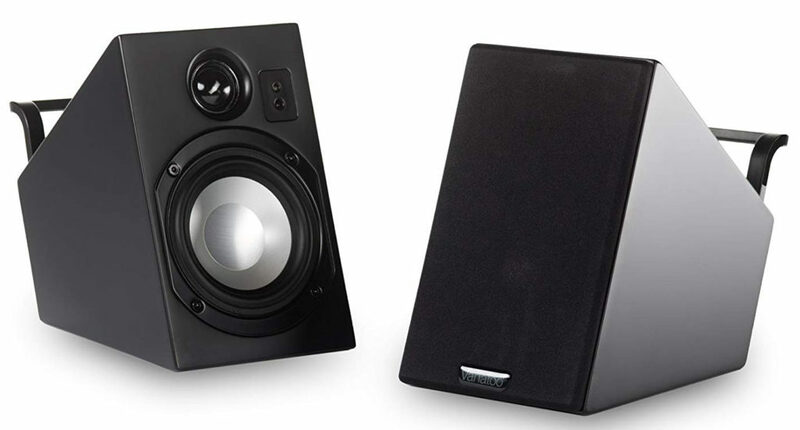 Both drivers are custom-made for this specific set of speakers – these are not generic drivers you can find on other speakers made by other manufacturers. One thing that kind of surprised us was the 1in tweeter. The majority of speakers of this size use smaller (.75in or even smaller) tweeters. The crossover between the woofer and tweeter is set at 2,200Hz. The cabinets are made of 0.35in thick MDF with a rubber coating. They look quite sturdy and durable. 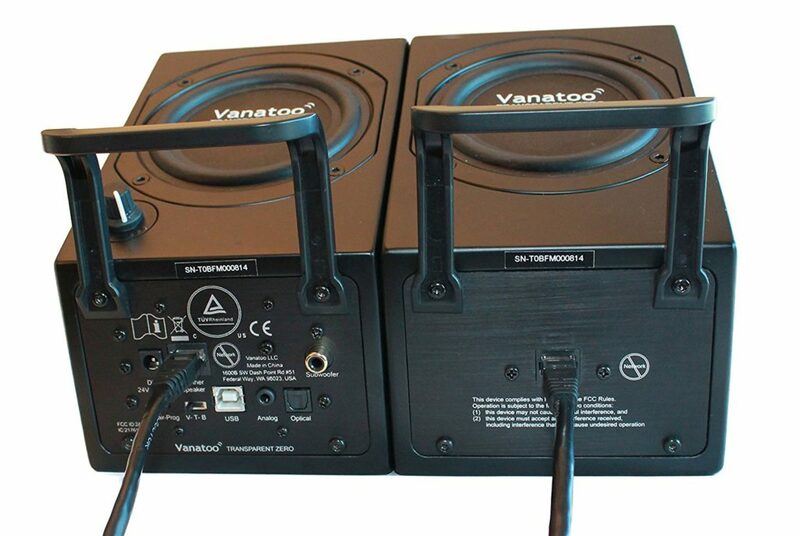 Vanatoo Transparent Zero speakers can play in mono or stereo mode. Switching between the two modes is done by selecting the right button combo (V-T-B/Pair-Prog/Volume knob) on the active speaker. It’s not like you absolutely need mono sound but there are some scenarios in which that could be useful. For example. if you want to grab the active speaker and take it with you to the garage, you will have to switch to mono sound to get a normal performance (instead of only one channel). The speakers also feature sleep mode (not auto turn-off mode). If there is no audio signal for 20min, the speaker will go to sleep. Sleep mode reduces power consumption (from 6W to 0.5W). In case you don’t like the sleep mode, you can always turn it off by selecting the right button/switch/knob combo. The IR remote that comes with the speakers is small, it looks sturdy, and it’s very responsive. You can use the remote to select the source, adjust or mute the volume, initiate Bluetooth pairing, and adjust bass and treble. There are two interesting buttons on the remote – Auto button and Enable button. When you press the Auto button, the audio source will be selected automatically in accordance with the input hierarchy. The input hierarchy goes like this – 1. AUX, 2. USB, 3. Optical, 4. Bluetooth. We will discuss the way this automatic input selection works in the next section. Enable button has an odd function – in order to adjust the bass, treble, or initiate pairing, you have to press the Enable button first, and then press the treble – or treble +. There is no way to turn this annoying thing off and avoid using the Enable button. Installing Vanatoo Transparent Zero is a relatively easy task. Position the speakers, select the orientation (you can play with different orientations to find the type of sound you like more), connect the audio sources, plug the power cable into the wall outlet, and turn them on. By default, the speakers will play audio in stereo mode, the active speaker is the right channel, and the sleep mode and shelved DSP settings are enabled. You can change all these default settings (play audio in mono, place the active speaker on your left side and use it as your left channel, select flat DSP mode, or disable sleep mode). This is where the things get tricky – changing the software settings is the only thing we don’t really like about this speaker set. If you want to change any software settings, you can’t use the remote. Instead, you have to use the buttons on the active speaker. Enabling or disabling any function requires using the volume knob, V-T-B switch, and Pair-Prog button. You have to select the right volume knob and V-T-B switch positions and then use the Pair-Prog button. It sounds confusing but you just have to follow the instructions from the manual and you will figure it out. Look for the right combo in the user manual (in our case, we are looking for the combo that allows us to use the active speaker as our left channel). 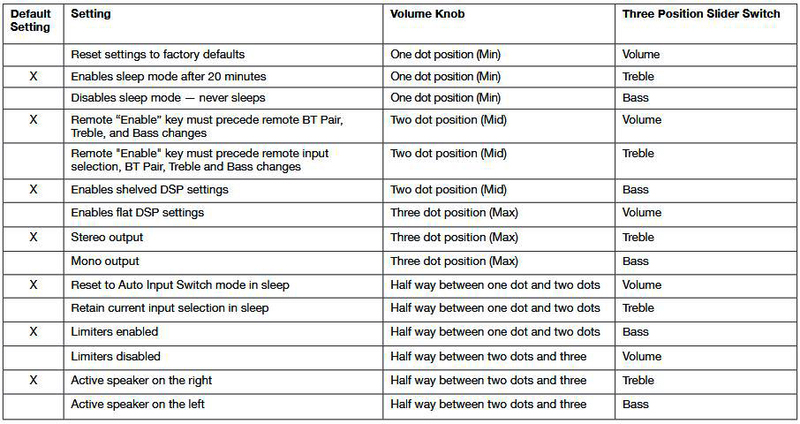 The instruction says – set the volume knob halfway between two and three dots, and then set the V-T-B switch to B (Bass). After setting the volume knob and V-T-B switch, you should press the Pair-Prog button and plug in the power cable while holding the Pair-Prog button. After you release the Pair-Prog button, the new settings will be applied. So, it can be confusing but it’s not that hard. The only problem is that there’s no way to figure out the volume knob and V-T-B switch positions for different settings without the manual. One more performance-related thing we want to discuss is the automatic input selection. When automatic input selection is enabled, the speaker will check the active sources and, if two sources are playing, the source/input with a higher priority will be active. As we have said, the analog input has the priority over USB, optical, and Bluetooth connection. So, if you have your TV connected to the speakers via TOSLINK cable and some analog source (your phone, for example) connected via AUX cable, and if both devices are sending audio signals, the speaker will play the analog source. If you want to activate some lower-priority source, you will have to do that manually (in this case, press the Optical button on the remote). Also, there’s one more thing you should be aware of – when two sources are sending audio signals and the source with a higher priority stops sending the signal, the speaker is not going to play the lower-priority source immediately. There will be a 7s delay and if the higher-priority source remains silent, the speaker will start playing the audio from the other audio source. Now that we have covered some installation and setup tricks and tips, let’s discuss the most important thing. We’ve been truly amazed by the audio performance and sound quality this speaker set can deliver. Considering the size of these speakers, the bass extension is surprisingly deep. The bass doesn’t reach crazy low frequencies, but anything above 60Hz sounds impressive. The bass is punchy, impactful, and well-textured. Transparent Zero speakers deliver substantially lower bass than any other small speaker set. There’s a very small bump around 200Hz (in shelved mode) which makes the sound a bit warmer. The midrange is perfectly balanced, dynamic and very detailed. The treble is also clear, almost sparkling. There are no peaks and no noticeable harshness in the treble region. There’s no distortion, even at high volumes. Also, the bass, even though is very deep, stays very controlled and never puts any shadow on the low midrange frequencies. The issue we’ve had with this 2.0 system is the vibration transferring. The speakers don’t have a rubberized bottom and rubberized handles/kickstands, and when some bass-heavy music is played the vibrations get transferred to the surface and cause the speakers to move. You can easily solve this by using the isolation pads – just place the speakers on the pads and you will eliminate all the vibrations. Still, covering some surfaces with rubber sounds like a better idea than using isolation pads. The speakers are quite loud for their size but that’s hardly enough to fill up a large room (15x15ft or 20x20ft) with sound. You will get much better results if you add a subwoofer, but it’s still not going to be enough for large rooms. We would definitely recommend adding a subwoofer to this set. Adding a nice sub will give you a much more dynamic audio reproduction since the speakers won’t have to deal with really low frequencies. Imaging and soundstage are phenomenal. The imaging is very accurate – you can pinpoint the exact position of the instrument, even if some orchestral music is being played. Soundstage is wide and very lifelike. This kind of performance makes Vanatoo Transparent Zero speakers perfect for many purposes. 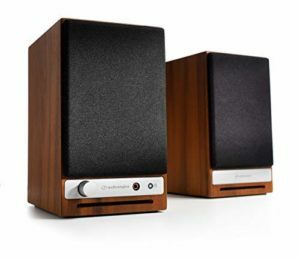 They can be used as desktop PC speakers or gaming speakers, TV speakers or even as bookshelf speakers in smaller rooms. AudioEngine A5+ wireless speakers are $150 pricier and a bit larger than the Vanatoo Transparent Zero. 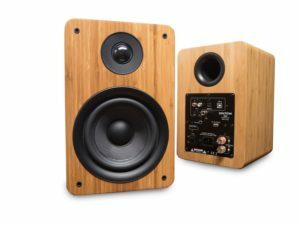 AudioEngine A5+ speakers offer pretty good versatility but don’t have any physical digital inputs. On the other hand, Transparent Zero speakers have TOSLINK and USB Type-B inputs. A5+ speakers deliver slightly better Bluetooth performance but they are both pretty good. When it comes to audio reproduction, A5+ speakers deliver even better sound quality (more dynamic and more detailed sound) and deeper bass. A5+ speakers offer slightly better audio performance but they have their own downsides and if you need physical digital connections, Transparent Zero speakers should be your choice. If you want to find out more about A5+ speakers, you should read our detailed AudioEngine A5+ review. Peachtree Audio M25 are basically priced the same as Vanatoo Transparent Zero (+/- $10 price difference). M25 speakers feature more ordinary design compared to Transparent Zero. Some of you might like the M25 speakers more. In terms of connectivity, both speaker systems offer the same kind of versatility. They both have analog, digital optical (TOSLINK) and USB Type-B inputs. They both have Bluetooth, but Peachtree Audio M25 doesn’t feature support for aptX. In other words, Transparent Zero speakers deliver slightly better audio quality in Bluetooth mode. When it comes to sound quality in other modes, we prefer Transparent Zero. M25 speakers deliver quite clear and flat response but Transparent Zero delivers more detailed and richer audio. M25 is a little bit punchier but Transparent zero delivers sweeter midrange and clearer highs. If you want to find out more about Peachtree Audio M25, you should read our detailed Peachtree Audio M25 review. AudioEngine HD3 is a little bit cheaper and smaller than the previously mentioned A5+. HD3 speaker set is priced the same as Transparent Zero but doesn’t offer the same kind of versatility and performance. HD3 features RCA analog inputs, USB audio input, headphone output, and Bluetooth with aptX support. Transparent Zero speakers have an additional TOSLINK input which gives them the edge over HD3 when it comes to connectivity. Transparent Zero is also more versatile when it comes to placement and orientation. When it comes to sound quality, Vanatoo Transparent Zero speakers are clear winners. We like the HD3 speakers and the sound they deliver, but there’s no doubt that Transparent Zero speakers deliver deeper, more detailed, cleaner, and louder sound than the HD3. The only thing we like more about HD3 is the design but that’s just a matter of taste. In case you haven’t noticed, Vanatoo Transparent Zero speakers are really good. There’s a lot of things to like about this set – placement and orientation versatility, connection versatility (AUX + TOSLINK + USB + Bluetooth with aptX + SUB output), customization options, and most of all, remarkable sound quality. There are some minor downsides but most of them (at least the most important ones) are easily solvable (for example, it’s easy to eliminate vibrations by placing the speakers on isolation pads). If you are looking for a pair of speakers under $400, this oddly shaped speaker set deserves your attention.